Anna one option would be to include one shallow frame amongst your regular sized brood frames. The bees will always fill the sort of space which that leaves beneath it, and will preferentially build themselve a comb of drone brood if that is what they sense they need. It will then be quite obvious to you where the drone brood is, and very easy to cull it if you want to. I think that will work better than frames without foundation, where the combs may not be built so neatly and you could end up getting very messy with brace comb being built joining the frames together. A single shallow frame amongst the deeper brood frames is likely to be all they need. In the UK we do that as part of varroa mite control: varroa mites prefer drone brood, so culling it gets rid of a good number of mites. Personally I'd leave the drones to develop if it wasn't for the varroa problem. The reason nature produces more drones than queens needing to be mated is that it improves the chances of mating even in adverse circumstances. There is only a brief window of opportunity for mating and if the queen misses that due to bad weather the colony is doomed. 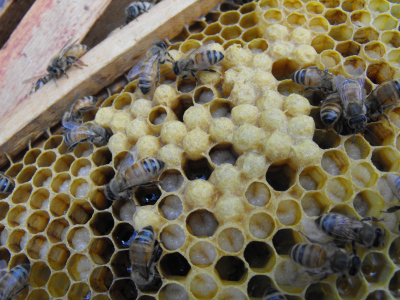 It's not only your own queen to consider - with the problems with bees we need to ensure as many queens as possible get safely mated in every neighbourhood. Good reminder about culling drone brood to deal with varroa mites! So far, we haven't had to do that --- we have a screened bottom board, and when I checked on mite levels last fall and winter, they were within manageable range. I should probably check again, though! We've actually had really good luck with foundationless frames. (It's not quite as simple as not using foundation --- I do provide the bees a little strip to get them building in the right direction.) They built nearly everything straight and included spaces for drones amid the worker brood. I think that I'm running into is that one deep isn't enough space for all the brood they want to raise! I've been reading lately that if you give them more space for brood, they'll fill it up and will have masses of workers, which means more honey. I'm in favor of more honey. Very interesting! Glad to see you're doing pretty well in your second year. We're hoping to get started this year, yet, if we can find someone to sell us some bees! Our hives are on the way, at any rate. I've been reading everything I can. We're trying our hand at the top bar hives, though. I can't find too much on management specifically for them, though. I'd recommend getting them started ASAP! 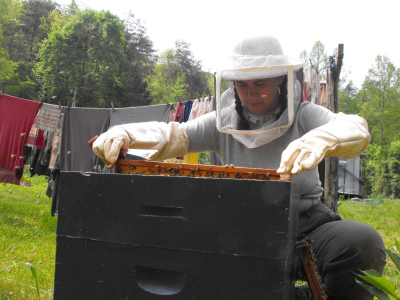 We started one of our hives a couple of months before the other and it is still significantly stronger a year later. A package needs plenty of time to build up their stores for the winter. Good luck!